Austin is a busy, fun town. It’s made up of many smaller towns – each filled with its own unique group of passionistas: film town, music town, technology town, hippy town, liberal-political town, foodie/wine town, writer’s town, gay town, innovator’s town. People know each other in each of these towns. When I go to a concert, I’m assured of running into dozens of musicians and fans that I know from years of dancing and concert-going. When I attend an Austin Film Society event, I run into filmmakers and passionate film goers that I know from 10 years of attending film events and one or two of the 11 Film Festivals, not to mention seeing over 200 annual movies in theaters (I’ve never seen a DVD). As an innovator, dancer, author, film-crazy-person, and political activist, I know a lot of people here. And whether with my crazy musician friends or my gentle dance friends or my passionate, smart film friends, I could be busy busy busy attending the myriads of things going on here. In fact, my ‘joke’ is that I have to tie myself to a chair to stay home. Music: Dwight Yokum, Neil Young (NEIL YOUNG), hip hop musicians teaching youngers how to rap and design artistic graffiti (plus 100 live music venues a night playing the best blues in the world). Parades: Gay Pride Celebrations (4 days of bands, dances, movies/documentaries). Gardens: how to design gardens to attract birds and butterflies. Think Tank: discussion about immigration; radical theory/radical change discussion group. Hiking: celebrate national hiking day by hiking our hundreds of miles of hike/bike trails. OK? If there are not 3 things here you can choose to do in this wide array of stuff, you need to get a life. That leads me to my malaise. I had a list of about 20 things to choose from. And what did I do? 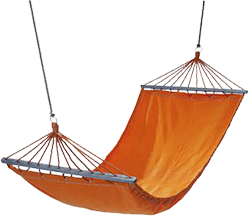 I laid in my hammock (gorgeous, handmade double hammock that I brought back from Nicaragua), by my pond, under the shade of my fig tree, next to the jasmine, and I read a fascinating book called The Shallows: What the Internet Is Doing to Our Brains by Nicholas Carr. As I was lying there, gently swaying, and taking notes on where my mind was going with new ideas, I realized that I was indeed, rocking alone. I’m single, and at some point, dating would be a good thing to do. I know that intellectually; I never planned on being single as long as I have (don’t ask how many years since my divorce) although my single-ness (once my son was grown) has allowed me an unrestricted set of life choices that I happily, greedily indulged in. In fact, I love my life as it is, and I know that I’ll make the necessary changes to accommodate a Partner (the Right partner, of course, and at this age I have no need to settle). I will be happy to do that. But to find a mate, I have to get out of my hammock. I have a grown son. I have written books, lived around the world, run businesses, played with international friends, trekked through jungles, started up a successful not-for-profit, and had many, many loving relationships. My ‘drive’ to find a partner is not the same as it was when I was younger. I no longer need a man to make a family, or provide income, or make a home. And I am certainly cranky enough to demand an emotionally present, spiritual partner who knows how to communicate honestly. But To find that person, I’d have to not read great books, or work as many hours as I work, or see as many movies as I see: I don’t seem to have the time to do everything. So I keep hoping that the Greater Good will send me just the right person at just the right time, and in the meantime I can have malaise – and it will all fall into place around me as I rock and read.